Scientists have been accused of cultivating a cold philosophy, one that would unweave a rainbow, but a group of scientists based at Boston Children’s Hospital would likely refute the charge. They are warming to a new kind of cellular barcoding, one that weaves a rainbow of its own. Its multicolored glow can illuminate stem cell development, with dimming and brightening hues corresponding to the decline and rise of distinct clonal subpopulations. The barcoding system is being developed for hematopoietic stem cells (HSCs). It puts on color shows that could, if interpreted rightly, help scientists track and better understand blood disorders and cancers such as leukemia. “There's significant interest in determining how a stem cell clone expands, what makes one clone dominant, and why that predisposes you to cancer and blood disorders,” said Leonard Zon, M.D., director of the Stem Cell Research Program at Boston Children’s. Dr. Zon and his colleagues developed a barcode tool for use in zebrafish. The scientists used the tool to track the blood stem cells the fish are born with, the clones (copies) these cells make of themselves, and the types of specialized blood cells they give rise to (red cells, white cells, and platelets). Details of this work appeared November 21 in the journal Nature Cell Biology, in an article entitled, “Clonal Fate Mapping Quantifies the Number of Haematopoietic Stem Cells That Arise during Development.” The article describes how the scientists used a specially bred zebrafish called Zebrabow, which has multiple copies of genes for red–blue gene fluorescent protein scattered through its genome. By activating certain enzymes, the scientists cut the red–blue–green assembly in different ways and in different amounts. 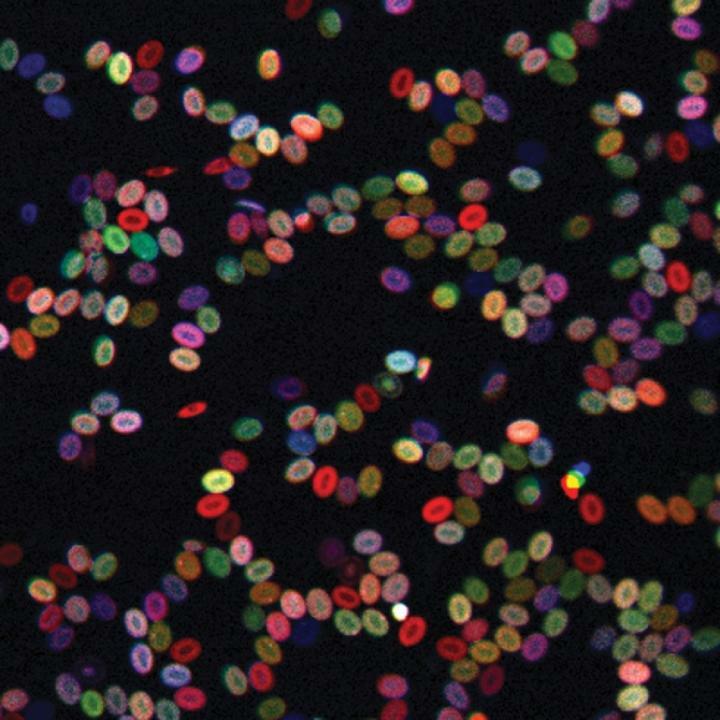 This technique yields, in theory, about 80 different colors based on the cell's overall proportions of each fluorescent protein—each color representing a different clone or variety of blood stem cell. Other scientists have developed tracking systems based on genetic barcodes. But these systems require that cells be dissected. Accordingly, these systems cannot analyze living, circulating cell populations. A normal blood system tends to have a diversity of clonal stem cell types—all cells being genetically identical but with different epigenetic changes that affect gene expression. Being able to track how different clonal populations develop has many implications for medicine. For example, leukemia and myelodysplastic disorders are thought to arise from a clone of an original stem cell that went amok and began replicating in great numbers. But until now, this sort of clonal expansion has been hard to analyze, since no one knew how many blood stem cells exist at the outset. Based on the zebrafish data, Henninger and Dr. Zon estimate that blood stem cells make up about 20% of all blood cell progenitors at the time they are formed. Dr. Zon and his team are now rushing to put genes that are mutated in humans with clonal expansion, and that predispose to leukemia, into the Zebrabow fish. Dr. Zon hopes the experiments will reveal how the dominant clones expand, and ultimately become cancerous.